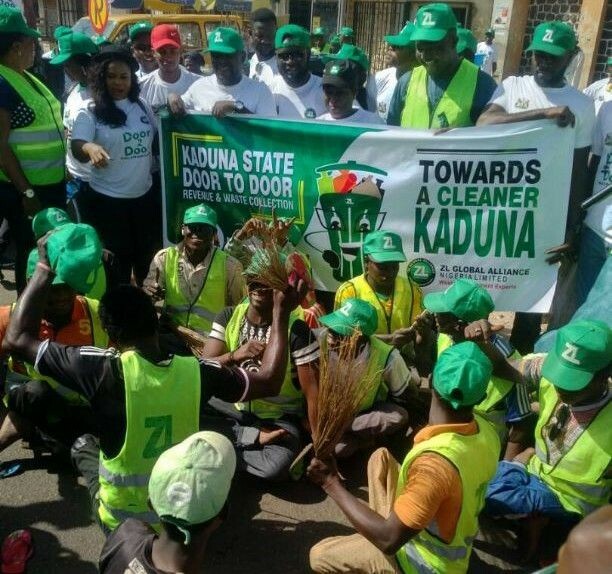 In Kaduna on Thursday, Kaduna State government and staff and management of ZL Global Alliance staged a road walk to sensitise residents of Kaduna State on the enforcement of door to door waste and revenue collection beginning next week Monday. ZL Global Alliance is a solid waste management company engaged by Kaduna State government to be sole waste manager that will collect or arrange for the collection of the domestic waste in Kaduna, Kafanchan and Zaria which it has been doing effectively according to officials of the state government. Managing Director and Chief Executive Officer of ZL Global Alliance, Abiola Bashorun said, the exercise was necessitated by the need to inform the residents of Kaduna ahead the enforcement on Monday. The door to door waste and revenue collection which was launched about a year ago by Kaduna State Deputy Governor, Arch Bala Barnabas Bantex would now be enforced in order to generate additional revenue for the state government so it can execute more people oriented projects across the state. The MD/CEO who spoke through her General Manager Operation, Kate Ogenyi said, “yes we are embarking on the road walk to create awareness on enforcement of door to door collection of waste and levy. “We are starting from Lugard Hall roundabout here and then through Ahmadu Bello way, Junction road, constitution road, independent way and rounding up at Murtala Square all within Kaduna North local government area of the state. According to her, “ZL Global Alliance is the key contractor permitted by the State government to manage waste in Kaduna, Kafanchan and Zaria and that means, no private organization or individual is permitted to collect any level or fee on behalf of the state government apart from the recognized key contractor in conjunction with Kaduna State Internal Revenue Service (KADRIS). “The enforcement is commencing this Monday 27th November here in Kaduna and will be gradually extended to Kafanchan, Zaria and other towns across the state. “We are doing this with Private Sector Partnership (private waste collectors who are ready to work with us). The idea is to add to revenue generating effort of the state government so there can be more money for the government to execute people’s oriented projects. “We are starting with eye brow areas like commercial centre where we have banks, hospitals, schools, filling station, market etc, GRA and then residential. It was officially launched last year by the State Deputy Governor, Arch Bala Barnabas Bantex but we are about to commence the enforcement”, she explained.